Did you know that one gallon of water weighs a little more than eight pounds? When water from a storm builds up in your attic, it comprises the drywall of the ceiling making the ceiling weaker and eventually letting the water cave in and creating a hole in your ceiling. SERVPRO of Harlingen and San Benito were able to clean-up this disaster and make it "Like it never even happened." Do Your Ceiling Have Spots Like This? If your ceiling has spots like these, you need to act fast! These brown circles come from a water leak and can be a source of fungal growth. Luckily the owner of this building called SERVPRO Harlingen/San Benito and acted fast to prevent this from happening. When water starts rising in a building, moisture will be absorbed by the walls and could cause fungal growth. In order to prevent that from happening, SERVPRO Harlingen/San Benito had to remove a section of the wall and make it look "Like nothing ever happened. When our technicians arrived on the scene of this apartment, they discovered that the flooring was very damp. In order to prevent fungal growth, SERVPRO Harlingen/San Benito had to remove the flooring to dry the area. After water was found in the ceiling of this apartment, we at SERVPRO Harlingen/San Benito had to clean up and make sure that we stopped the possibility of fungal growth. Once it was discovered that rainwater was gathering in the ceiling, it was imperative that we at SERVPRO Harlingen/San Benito cleaned up and repaired the mess that the storm had caused. After a storm ravaged through an apartment building, our amazing technicians from SERVPRO Harlingen/San Benito went to work tearing up the carpet to prevent any further damage to the flooring and structure of the buildings. Here are our SERVPRO Harlingen/San Benito technicians drying some plywood that was damaged by a leak in a local house. After our technicians left, it looked like nothing had ever happened. After a water leak was discovered in a home, SERVPRO Harlingen/San Benito was on site to help the homeowner get their life back together as quickly as possible. We made sure that the problem was solved and that the owner was able to move back in their house. SERVPRO Harlingen/San Benito was on site to clean up a local retail store after a pipe had burst, and the floor became soaked with water. The manager of the store was happy that we could quickly clean up the store and they could get back to work. SERVPRO of Harlingen/San Benito was called to dry a local restaurant after a pipe had burst and caused the dining area to become soaked in water. The owners were very grateful to our technicians because they made it look like nothing ever happened. This is a picture of some of the wet drywall/insulation that had to be cleaned up by SERVPRO Harlingen/San Benito. This is the result of a fire in a funeral home that was extinguished by a local fire department. After a company called SERVPRO of Harlingen/San Benito to clean their industrial kitchen, they were amazed at how clean we made it look! We are available 24/7 to make everything look like nothing ever happened. After a storm caused the water to rise in a local home, SERVPRO Harlingen/San Benito was quickly on site to dry up the water and make this kitchen look like nothing ever happened! This is the result of soot remaining on the walls after a fire. At first, I thought they were cobwebs, but I was informed otherwise. Now it looks like the fire "Never even happened." SERVPRO of Harlingen/San Benito was there to help and will be there in the future for everyone that needs it. Our crew members have been through vigorous training to properly restore buildings to the way it was. Here our crew members are gearing up with their PPE's (Personal Protective Equipment) to properly do the restoration to a fire damage. So when you want a highly trained team working on your home call SERVPRO of Harlingen and San Benito at (956)277-0645! Here at SERVPRO of Harlingen and San Benito, our team is here for you when any disaster strikes! We have highly trained team members with vast knowledge and training. So when disaster strikes remember to call us here at SERVPRO of Harlingen and San Benito (956)277-0645 we are open 24 hours, 7 days a week, 365 days a year! Some of our crew members came out to walk with our parade float at the Rio Grande Valley Livestock Show. We had so much fun being apart of the parade to kick the week off! This was a water damage that happened due to a water heater leak, the owners were in shock of how fast we arrived and how quickly and efficiently the job was finished. Hotel Lobby flooded by a broken pipe. This was the outcome of a broken pipe, completely flooded a hotel and home of the hotel owner. Thanks to the expertise of SERVPRO Harlingen/ San Benito, the hotel and home were dried completely within a minimal amount of time! 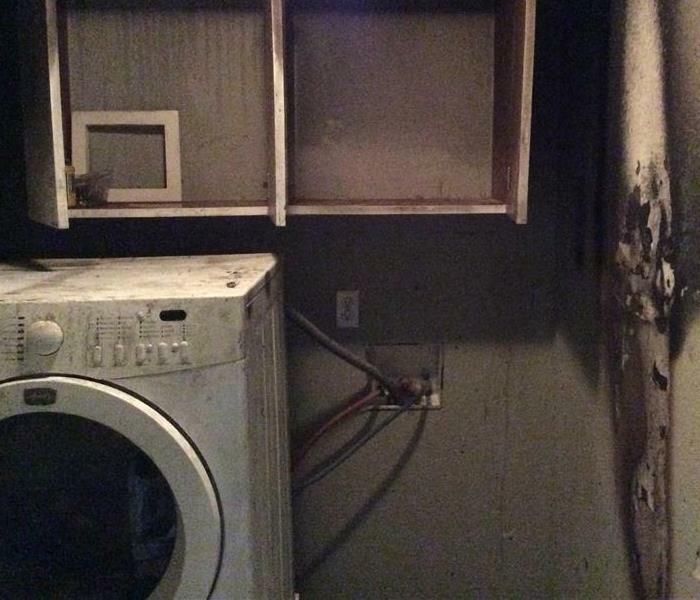 Laundry Room Fire Caused by Dryer. A dryer caught fire in the laundry room and scorched the wall in the laundry room and smoke and soot damage to the rest of the house. Always make sure that you are cleaning out your lint trap after every load!